Jari-Matti Latvala goes into the final day of Wales Rally GB just 4.4 seconds behind Sébastien Ogier. The scene is set for an epic finish to the 2018 edition of Dayinsure Wales Rally GB tomorrow, after the momentum in this year’s FIA World Rally Championship title fight swung dramatically back and forth in front of thousands of enthralled fans in the heart of the classic mid Wales forests. Under bright, sunny skies, spectators flocked to the stages in huge numbers with an appetising itinerary of Myherin, Sweet Lamb Hafren, Dyfi, Gartheiniog and Dyfnant in the scenic Cambrian Mountains – some of the most demanding and spectacular speed tests anywhere in the world. They did not go home disappointed. With no midday service and almost 100 miles of flat-out competition, any issues or errors were always going to be magnified today – as two of the three title protagonists found out to their cost. First to fall was World Championship leader Thierry Neuville, who slid into a ditch on the first run through Hafren. It was only the assistance of quick-thinking spectators that enabled the Belgian to rejoin – but the delay dropped him well down the order. The drama, however, was not over yet. Overnight leader Ott Tänak had stretched his advantage over his pursuers to more than 40 seconds and looked to be well on-course for a fourth consecutive triumph – as well as the World Championship lead – when a radiator issue grounded him on the second blast through Sweet Lamb Hafren, instantly turning the rally on its head. The Toyota star’s misfortune promoted defending World Champion Sébastien Ogier to the top of the timing screens – quite a turnaround for the Ford driver, who had looked to be out of contention to win the event following gearbox gremlins yesterday. The Frenchman – who had promised to push following his Friday frustrations – is now embroiled in a thrilling four-way fight for victory. Ogier, Toyota’s ‘Flying Finns’ Jari-Matti Latvala and Esapekka Lappi and Ireland’s Craig Breen (Citroën) are blanketed by just 13.5 seconds ahead of the final day of the event tomorrow (Sunday). It certainly isn’t, and Sunday’s action will begin with the all-new Elsi speed test, before crews tackle the predominantly new Gwydir stage – both in the midst of the world-famous Snowdonia National Park, with the latter doubling up as the points-paying Power Stage. Extra points – and extra pressure. In Visit Wales’ ‘Year of the Sea’, the rally will conclude with the history-making Great Orme Llandudno test shortly after midday. After speeding around the iconic north Wales headland, competitors will race onto the closed public streets of the popular Victorian coastal resort before blasting past the flying finish on the seafront Promenade. To whet the appetite, Llandudno is hosting a motor sport festival in town over the entire high-octane weekend, with Red Bull trials biker Kenny Belaey wowing the crowds. The record-breaking Belgian will be back tomorrow, when the seaside Dayinsure Family Fun Zone will welcome more fans with a raft of free activities. Outside of the top four, notable mention must go to Kalle Rovanperä, with the 18-year-old rising star holding an excellent ninth overall and leading the supporting WRC2 category. Britain’s Gus Greensmith sits third in the WRC2 fight and just outside the top ten overall, with former British Champion David Bogie in 13th. Tom Cave slipped to 21st position after losing time in Dyfi, with fellow Welshman Elfyn Evans charging back through the order from 39th to 24th after an engine sensor curtailed his victory bid yesterday. Back at base in Deeside Rally Village, meanwhile, a special presentation was held to honour this year’s ‘Rally Legends’ – four-time World Champion Juha Kankkunen and Nicky Grist, who won the event together in 1993. 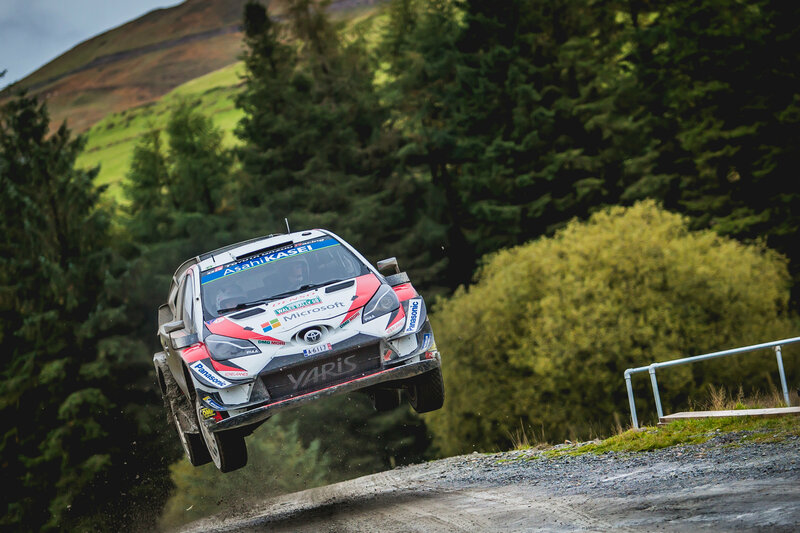 The pair will drive through the streets of Llandudno tomorrow in their victorious Toyota Celica – yet another draw for all those attending what is set to be a gripping final day of Dayinsure Wales Rally GB.